Pretty cool looking bike. Looks like it's got something for everyone, a little bit touring, a little bit cruiser, a little bit street-rocket. WHAT A GREAT LOOKING BIKE. !I WANT TO ORDER ONE NOW! I WANT THE FIRST ONE OFF THE PRODUCTION LINE, AND I WANT IT NEXT WEEK IF NOT BEFORE!!!! Looks great!! Needs just a little more wind protection and side bags (like the ST). I love the overall look. And that seat looks comfy for long rides. i like the front fairing and the modern integrated lights. if they put this in the dealer showroom soon i'll buy one. I need to know when the production starts, because I love to order one yesterday. I like the look of this bike, I would part X, my Honda CBR1000 for it now! 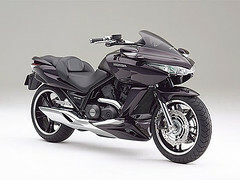 when will honda make this beauty commercially available in the philippines? Wow! It's everthing I've been looking for in a bike. I'd buy one today if they were available in the USA. Does look like it could use a better windshield. Luggage for the back would be the finisher. Honda - when are they coming here? Soon? I Want one and i want it now. I live in NOrth America, I would put off my next cycle purchase to get ahold of on of these new age "Honda Dreams". I remember the 1967 Honda Dream. That bike not only was ahead of its time, but changed the motorcycle industry almost single handedly. This DN-01 is the same type of bike in my opinion. Look at the gas prices and the amount of new cyclists that are getting into the sport. I have been riding for 35 years and most of my bikes are Honda's for a reason. I LOVE TO RIDE RED!!! I'm a geezer who last rode 40 years ago. Kids are grown and gone and this is what I want to ride into the sunset on. Where the hell is it Honda?!? Looking forward to getting on one- I have a 1981 CM400A (fully automatic when you kick it into second gear at a stop) and from 20 mph on up all you have to do is twist the throttle and zoom-zoom, it 'outshifts' everything else through traffic. What a fantastic bike! I currently ride a 2005 HD but when that DN-01 hits the dealers floor I'll trade the HD in & buy one! I checked with my local Honda dealer and he didn't know that the DN-01 concept even existed let alone what it's production plans were. Not a good sign! I told the dealer I would buy one today if it were available. Has anyone heard anything yet? Please, please, please say that this will come to the US!!! I ride an '02 Reflex but would gladly park this in the garage next to it!! I hear that they are planning to put it into production, but no word on bringing it stateside. Honda, PLEASE bring it!!! I want to buy one now! I too would buy this bike in a flash if it were available in USA. Having watched the videos and poured over the announcement, I think the thing that many riders may not realize is that the CVT transmission -- far from being a 'wimp out' vs. manual transmission -- is going to change the nature of precision speed control in and out of the corners -- indeed it may represent a revolution for riding twisties. Have a Honda Magna -- in some sense the original 'sport cruiser' and would add a DN-01 to the garage at almost any reasonable price. It�s only a tease I have been doing a lot of searching and it seems that the only real bike over 250cc is the Ridley and they are just out of my price range. The honda would be great at a resonable price. But it seems none of the cycle manufactures want to jump into the Auto cycle market except with scooters. I bought my first bike,scoot a Honda elite 250cc last year and use it every day but with my phisical disabilities and my age I would love to see a real bike, not a scoot, with a little more than the 250cc I want to do some traveling and not all rural roads I want to head out on the highway and do not want to invest in the higher cc scoots. So lets all get togeather and MAKE them want to sell us an AUTO Bike here in the USA. No word on USA availability. We will probably get it when we get the Transalp (i.e., never). I wish they would fire the guy in charge of the Honda America division and replace him with somebody who will bring these models to the USA. Tis Bike is super - how can i get it !!!!! Ah memang Hebat.... I would like tobuy one as soon as landed in the U S, please! Sutisna Rasidjan.